One of the reasons the Zulu parade is so much fun to watch, even if you don’t catch a coconut, is that its riders express so much joy. The city’s premier Carnival organization founded by African-Americans, the Zulu Social Aid and Pleasure Club has been parading since 1909. Its members include prominent politicians and business leaders, but the krewe is, as its website states, “the everyman club.” The king is chosen by a democratic vote of the membership, as are the other characters, including the Big Shot, Witch Doctor, Province Prince and Mr. Big Stuff. 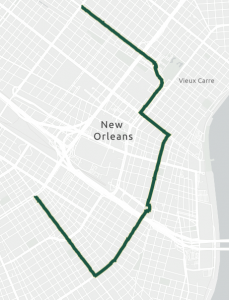 Mayor LaToya Cantrell will ride on horseback at the beginning of the parade that winds its way through Uptown and the CBD to end up at its headquarters in Mid-City. 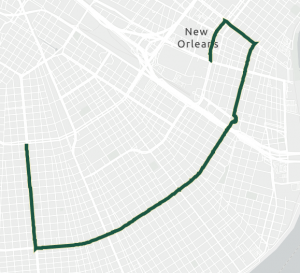 START: 8 a.m. at Jackson Ave. and S. Claiborne Ave.
Left on St. Charles Ave. Proceed on St. Charles Ave. around Lee Circle. END: N. Broad St. and Orleans Ave.
Click on the Zulu route map to enlarge it. Rex helps define Carnival in New Orleans. Its king, Rex, is the king of Carnival. Its colors — purple, green and gold — are the colors of Carnival. And its parade is the crowning glory of Mardi Gras. The group began parading in in 1872, as New Orleans was recovering from the Civil War, in part to entice tourists to visit the city (it worked). 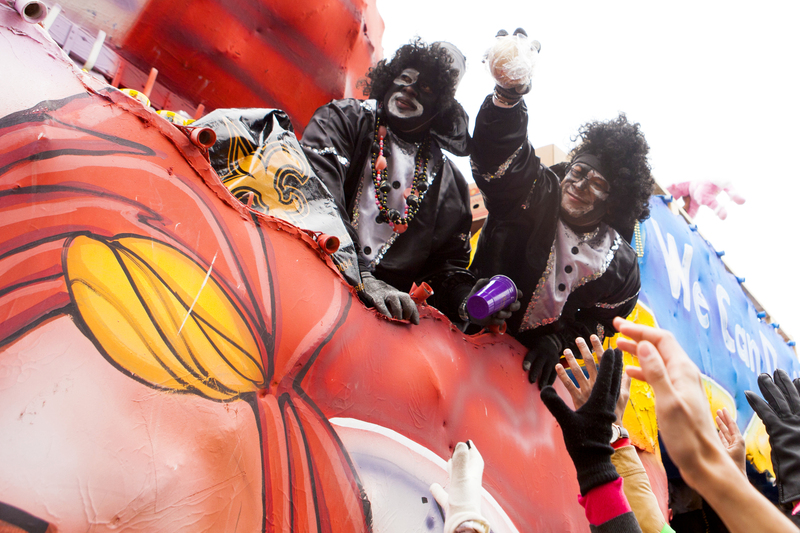 On Lundi Gras, the mayor hands over the key of the city to Rex, who rules over merriment until Ash Wednesday. The parade gives Rex a chance to greet his subjects. Its floats, most built on old wooden wagons with wood-spoked wheels, are known for their beauty, and the signature floats provide some of the classic images of Carnival. 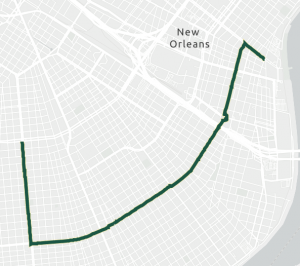 START: 10 a.m. at Napoleon Ave. and S. Claiborne Ave.
Left on St. Charles. Ave.
END: Canal St. and Tchoupitoulas St.
Click on the Rex route map to enlarge it. If you haven’t caught enough throws by the time the truck parades roll, you will catch plenty from these krewes. 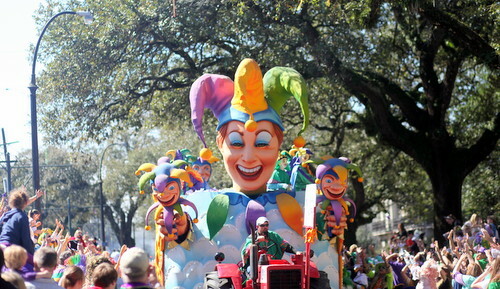 The Krewe of Elks Orleans follows Rex with individually designed truck floats carrying 4,600 riders. And the Krewe of Crescent City, the last parade of the season, follows Elks with 2,500 riders. These krewes set no overall theme. Instead, each truck represents a different Carnival organization, often family or neighborhood groups, with its own title and theme. This tradition goes back to the 1930s as a way to give more people a chance to participate in a Mardi Gras parade. The krewes have competitions each year for the Best Float in the parade. START: 10:30 a.m. S. Claiborn Ave. and Napoleon Ave.
END: Elk Place and Poydras St.
Click to enlarge the route map.